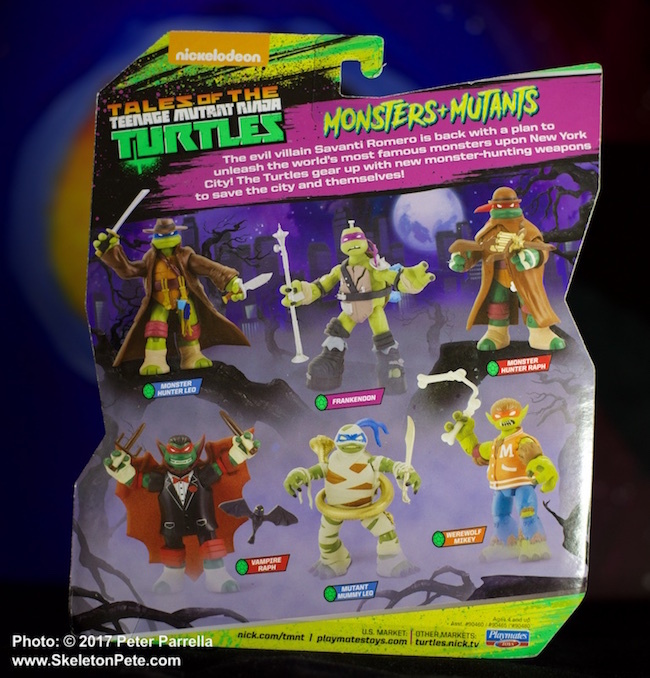 Our weekly Halloween advent continues with a look at Nickelodeon’s fifth season of Tales of The Teenage Mutant Ninja Turtles, which ties up the Monsters + Mutants story arc. 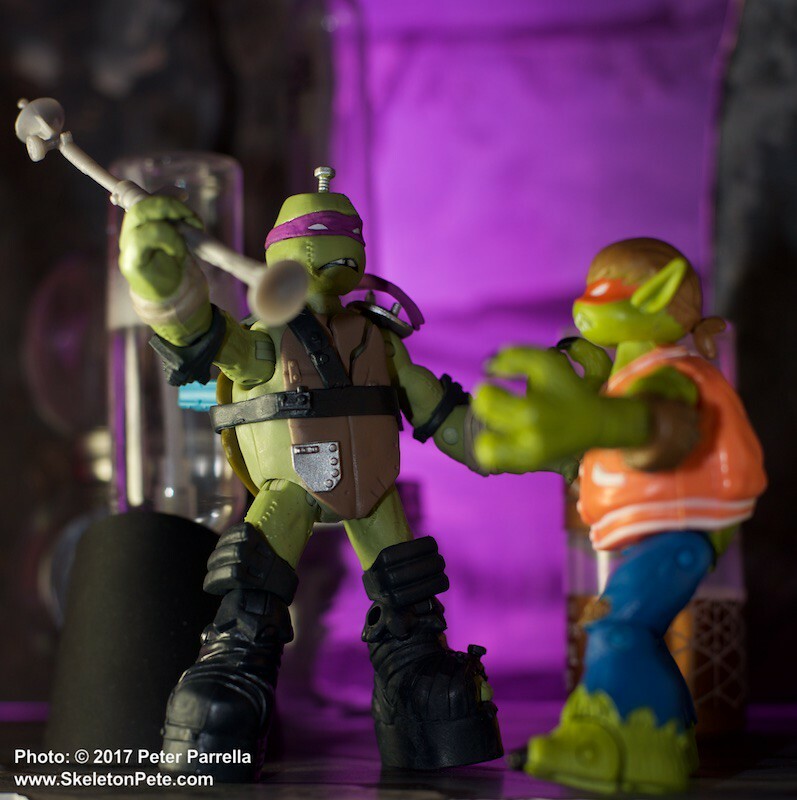 Our fearful feature is illustrated by home brewed photos of Playmates Toys awesome action figures that mirror the TMNT plot line. It’s Halloween night, trick or treaters are afoot, but New York City is being attacked by real monsters. No one is safe. 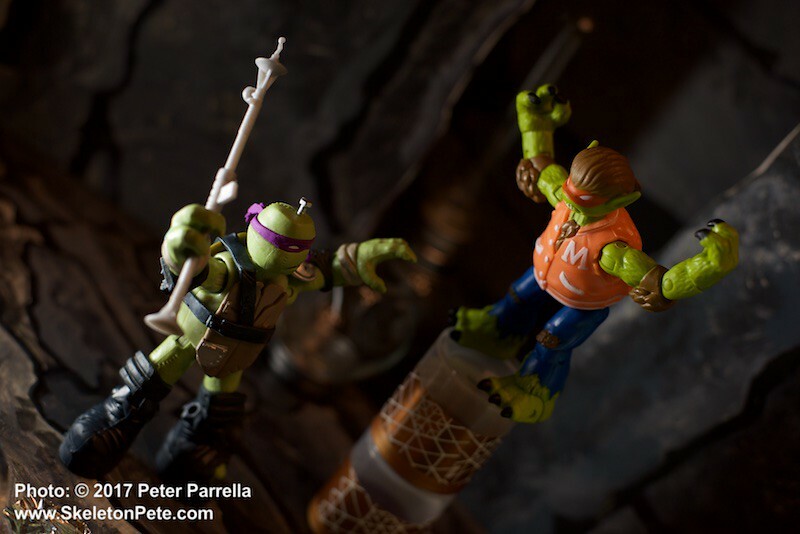 Even TMNT compadres April & Casey have been turned into vicious vampires. Not so surprising that the evil Savanti Romero is behind the mayhem. 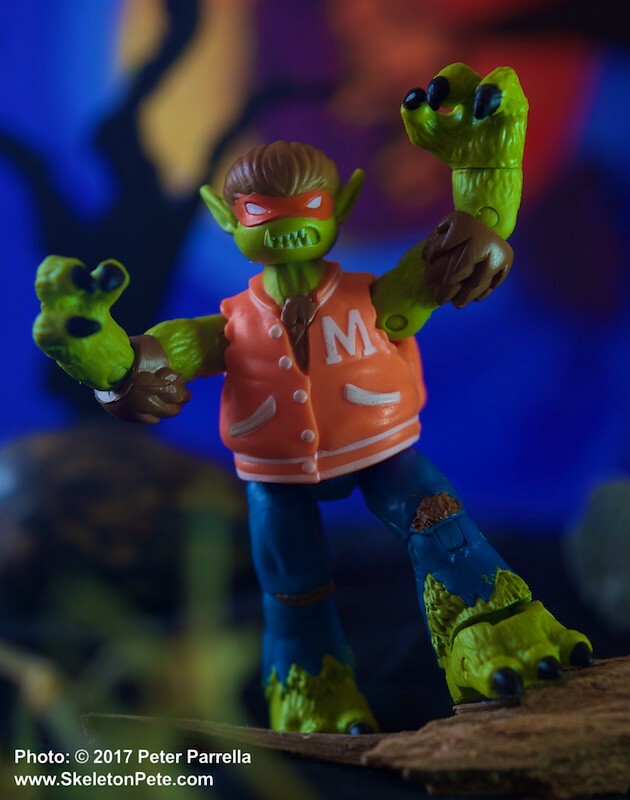 Aided by time traveler Renet, our heroes – those green teen pizza eatin’ machines – are back to battle classic creepers, Dracula, Frankenstein’s Monster, the Mummy and Werewolf. Along the way we’re treated to a fast paced, pun filled, thrill ride that takes us through time and across the globe in an attempt to stop Romero from recruiting the creatures into his legion. It’s a concept not unlike Ray Bradbury’s The Halloween Tree, which is my all-time favorite seasonal story. Solid animation, visual nods to original source materials, and quality voice talent make the series a great watch for kids and parents as well. “Monster Kid” Dads and Grand-Dads will positively love it. 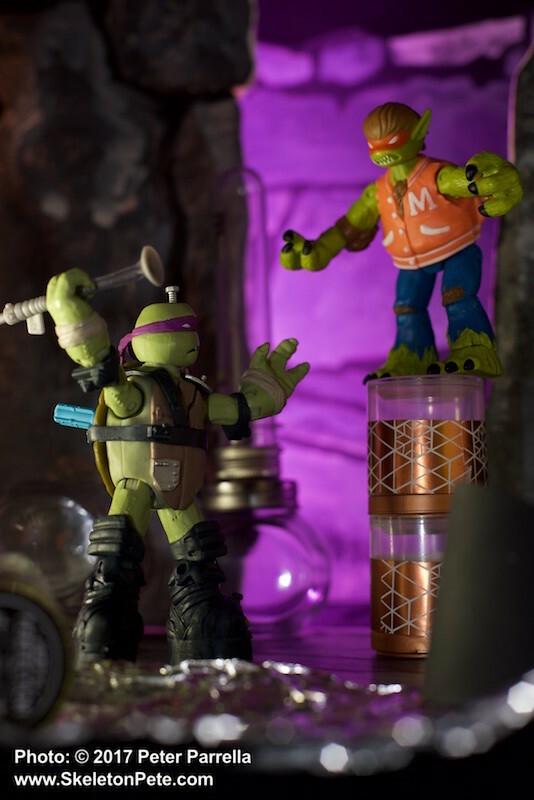 Playmates Toys’ TMNT FrankenDon action figure is ready for his close-up. 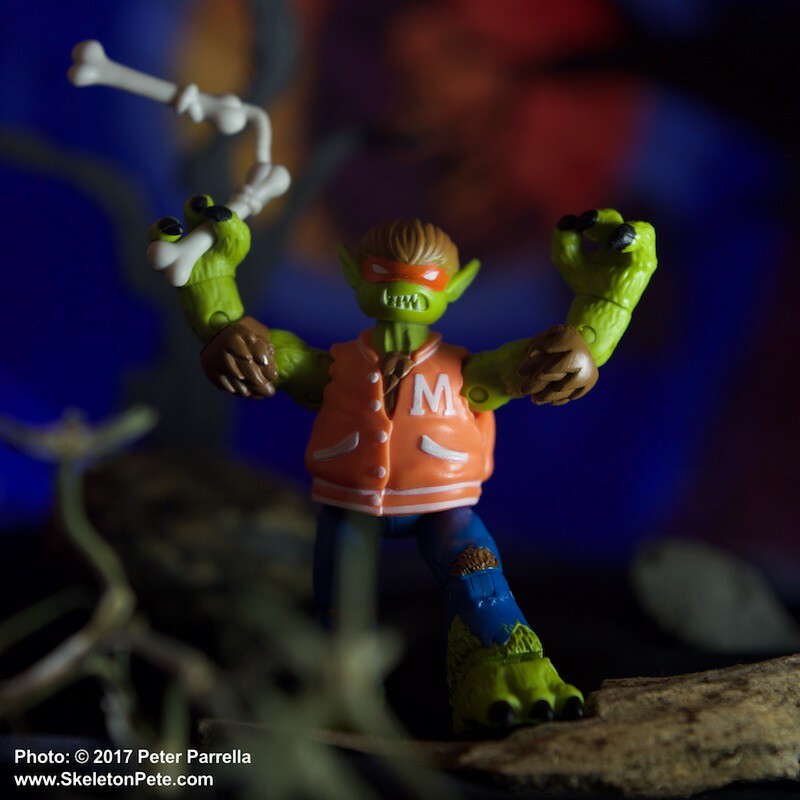 Playmates Toys let’s you bring the Mutants and Monsters action home with six figures based on the series. Each turtle is presented in mutated monster form. There’s Vampire Raph, FrankenDon, Mummy Leo, and following in the footsteps of those other two Michael’s (Landon & J. Fox) is teenage Werewolf Mickey. 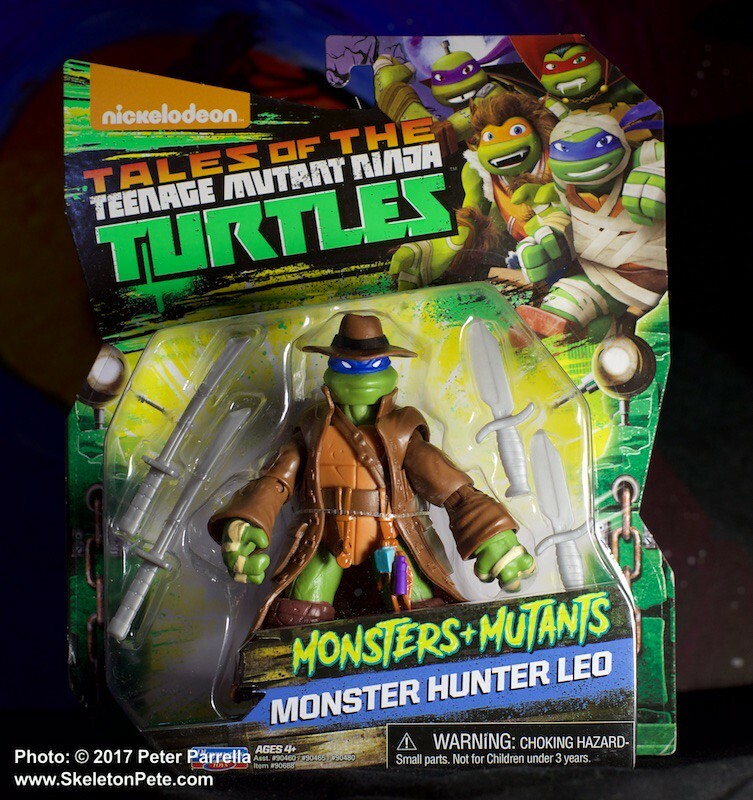 Raphael and Leo are also available in their Van Helsing “Monster Hunter” personas. In true Nickelodeon “Stay 90’s” fashion the series harks back to TMNT’s previous Universal Monsters characterizations. There are some fun accessories in every package. Werewolf Mikey sports a monogramed varsity jacket, a pair of boney nunchuks and the ubiquitous slice of pizza. 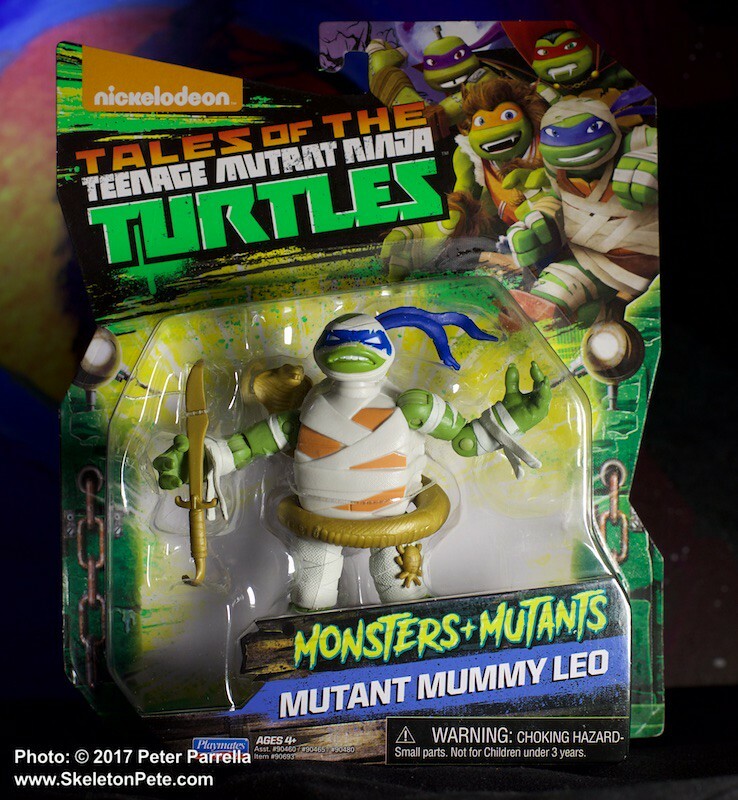 In addition to his sarcophagus wrappings the Mutant Mummy Leo is ringed by a golden cobra and sports a scarab. 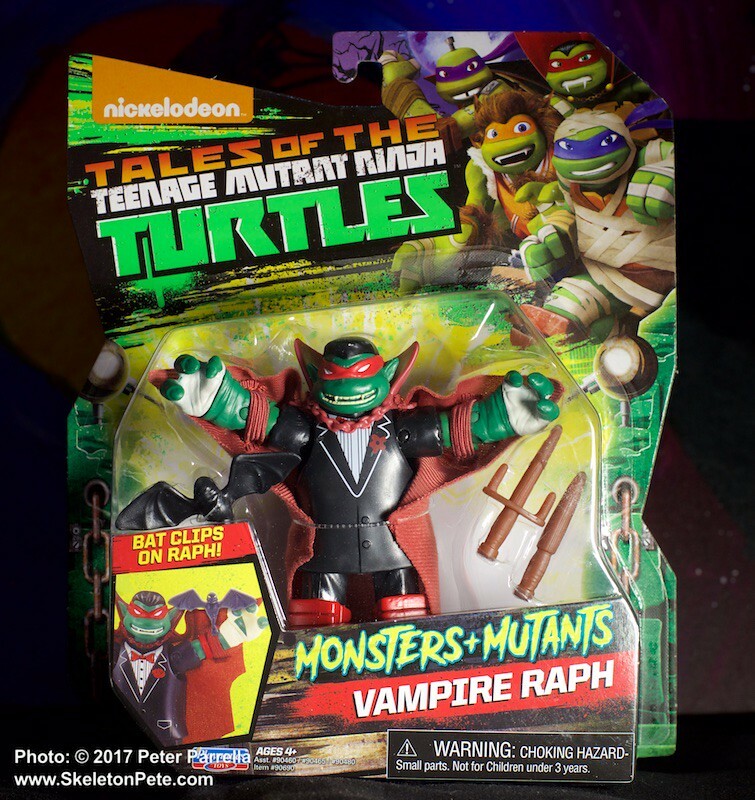 Vampire Raph is accompanied by a companion bat which attaches to his shoulder like a pirate’s parrot. He wears a real cloth cloak. Man-made monster FrankenDon is ready to take a powerful energizing lightning charge through the single bolt on top of his noggin, and the power modules on his shell. The approximately 5.5 inch figures are suggested for children ages 4 years and older. They have a nice chunky feel and plenty of articulation points. They are easy to manipulate and hold their poses quite nicely. I was able to get to them to stand on their own easily during the photo sessions. 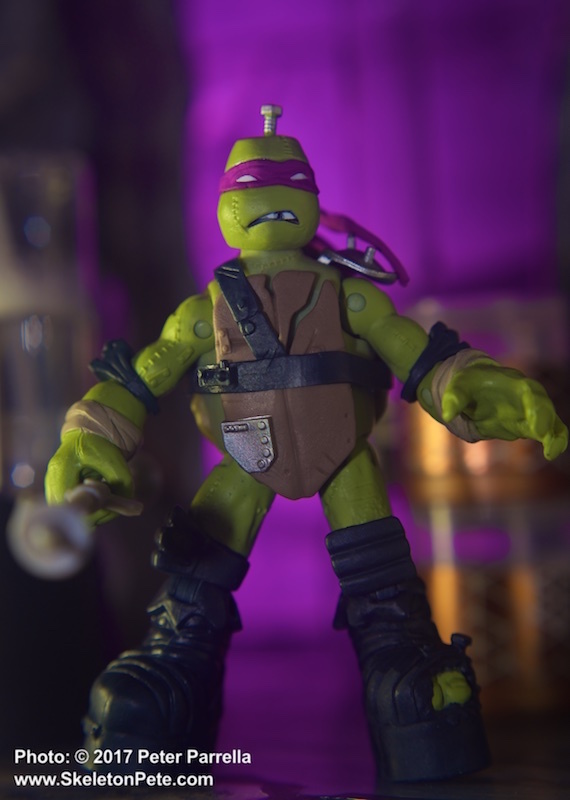 Sculpt details, like FrankenDon’s stitches and the garlic bulbs hanging from Vampire hunter Raph’s utility belt, are very nice touches that add lots of collectors item class to these reasonably priced products. Monsters + Mutants figures can be found at major retailers including Walmart, Target, Toys“R”Us and on Amazon for $8.99 each. 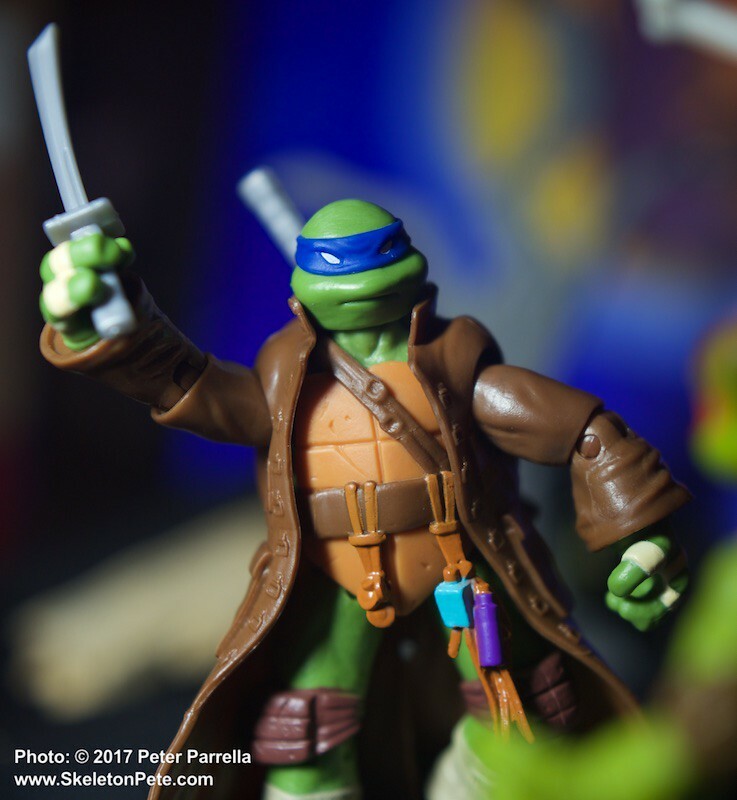 They join Playmates’ recent portrayals of the turtle team as samurai warriors (with a great Yusagi Yojimbo tie-in) and as well known members of the WWE (World Wrestling Entertainment, Inc.). 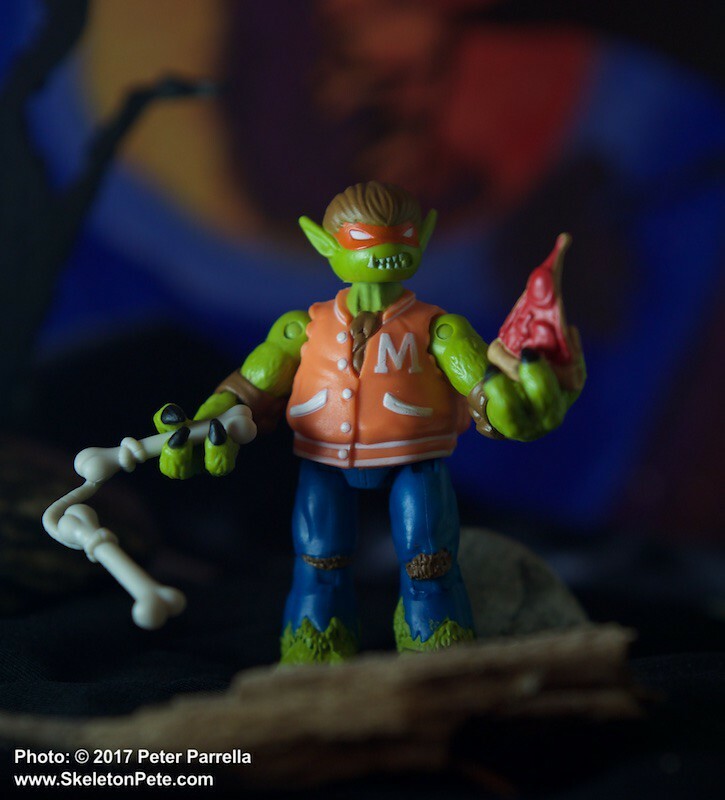 With limited “studio” space at the SkeletonPete abode, tabletop toy photography is exactly that, an endeavor that engulfs the entire dining room table. The fun part of these projects is repurposing regular household items to serve as appropriate looking props. With attention to depth-of-field choices most items are blurred just enough to trick the eye. Serendipity plays a big role, everything that happens to be within reach is up for consideration. For instance, a recent “paint night” canvas that my wife created, with its orange moon and indigo sky, served as a perfect backdrop for Werewolf Mikey. FrankenDon’s castle walls are foam core flats I painted for a Halloween gig Andy and I did years ago with our cover band Firing Blind. 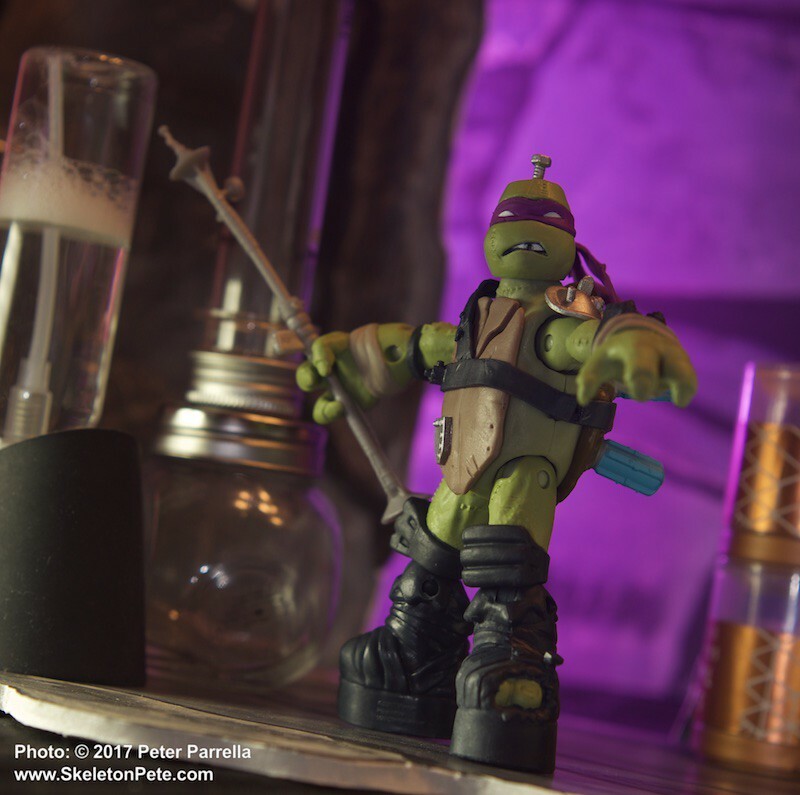 A purple gell over the background flash matched Donatello’s mask and the Kenneth Strickfaden inspired laboratory apparatus is a mix of candy jars, salt shakers, spray bottles and aluminum foil. 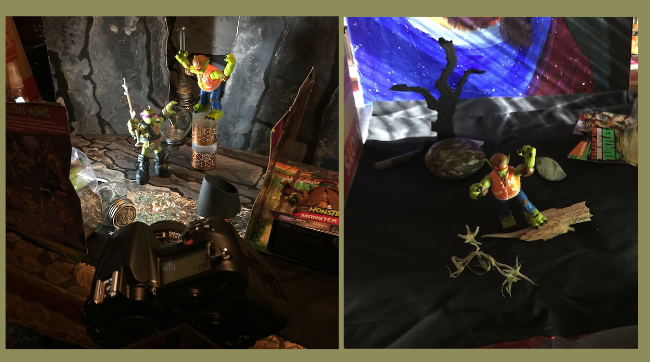 Behind the Scenes: The dining room table doubles as toy photography studio. Frankenstein Meets The Wolfman is one of my favorite Universal Monster movies. I remember as a pre-teen having a “Monster Flip Book” (think of it as a really old-school gif) that featured frame blow-ups of the two tearing it up during the film’s climax. I pretty much wore it to shreds. So I absolutely had to attempt my own version of a peak battle moment, when the Wolfman prepares to pounce as water from the burst damn begins to flood the laboratory. 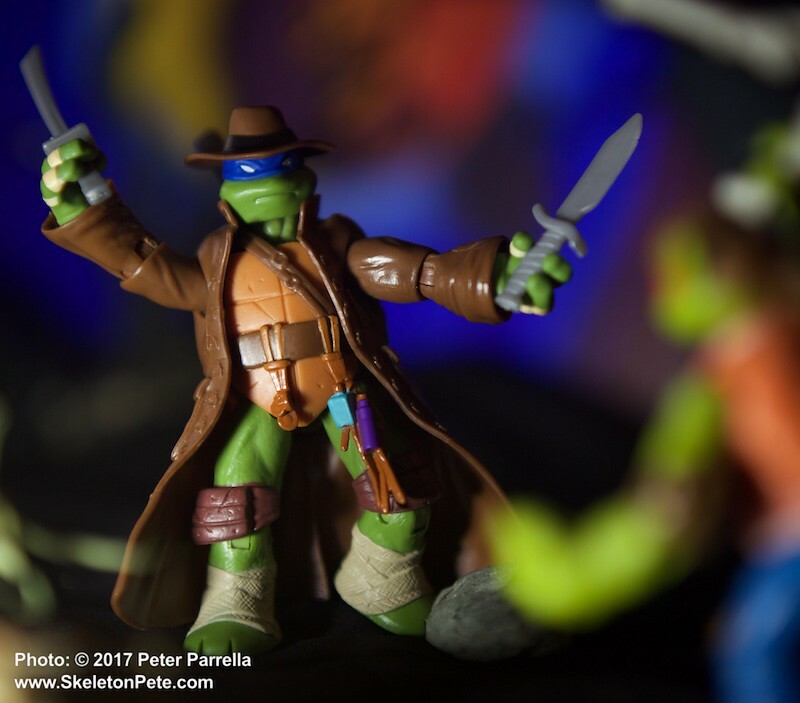 I’ll definitely be photographing the Leo Mummy and Vampire Raph figures in the near future and will be happy to share the results here.